Choosing the best concealed carry weapon comes down to finding a lightweight, reliable model that will be powerful and accurate enough to protect you should the need to use it arise. It should also be snag-proof and have integrated safety features. This is a lightweight hammerless model, which means it is unlikely to get caught on your clothing. 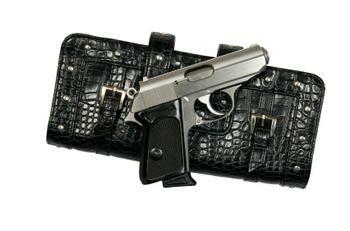 As for safety, this one comes with the Taurus Security System which allows the gun owner to lock the gun. When you're carrying it, you may want to think twice about having it locked. However, for storing it in the home, you will likely want to leave it locked, especially when there are children in the home. The Transfer Bar is another safety feature, and keeps the hammer from touching the firing pin unless the trigger is pulled all the way in. This 6 1/3 inch-long and 4.17 inch-high compact pistol is a 45 caliber. It's surprisingly powerful for its very small size. It holds six bullets, which is less than many other models, but it could still be the best concealed carry weapon for your purposes, trading off the number of bullets fired for a small size that is easy to conceal. You will want to have this gun in a holster (as with all GLOCKs) because there's no external safety lock. This small package packs the punch of a much larger firearm. Reviewers call it beautiful, easy to maintain, and easy to hide, plus they say there's a low recoil. It is also powerful for its size, and designed to be comfortable for almost anyone to use. It has a locked breech and tilted barrel system, and is available in two calibers (9mm and .40 S&W). It's made of stainless steel, so it's not likely to corrode even after exposure to sweat day after day. It's set up so that just about anyone can use it comfortably, thanks to an ambidextrous designed safety lever (on each side) and interchangeable backstraps which come with the gun. This gun has a snag-proof design, so you can whip it out of your purse or pocket without catching it on anything, which could delay your reaction time when faced with a dangerous situation. There is a slide-blade front sight to help you perfect your aim. If you have to reload, you'll take comfort in the fact that it's easy thanks to a tip-up barrel that allows the round to go right into the chamber. The design also makes it easy to clear out the chamber, and because it's such a simple design, jamming and stovepiping almost never happen. A curved grip area allows the gun to fit perfectly in the shooter's hand while preventing a pinched thumb. It's also made from a corrosion-resistant and relatively strong and lightweight titanium alloy. Reviews say it's barely noticeable, even when worn on the ankle. It's also lightweight, corrosion-resistant, and easy to maintain. GunWeek.com says Kahr compact pistols were "designed from the start for concealed carry." GunBlast.com says the PM9 "reeks of high quality" and "exhibits good craftsmanship" on the inside as well as the outside. It is also one of the smallest 9x19mm auto pistols out there, and it's flat, so it will fit comfortably in your pocket. The slide release is easy for a right-hander or a left-hander to access and use, and the gun won't fire if you don't pull the trigger completely due to a passive striker block. There are rounded edges and a textured trigger guard for a comfortable fit. Along with the six-shot magazine, you get a seven-shot one as well. The six-shot's edge fits right next to the gun's bottom, while the seven-shot gives the appearance and feel of a slightly longer handle. This gun offers a magazine capacity of up to 15 cartridges, it's lightweight, and it offers the "safe action" trigger system, which has three safety features that automatically reactivate after the gun has been fired. It's just 6.8 inches long and 5 inches high. The GLOCK site reports this gun in caliber 9x19 compact pistol to be "the most widely used law enforcement pistol worldwide." It's also reliable and easy to conceal.